Our Sweet Granules with Stevia is a delightful sugar free – low calorie sweetener perfect for your coffee, tea, cereal or fruit with a pure, undeniable sweetness that will have you forgetting sugar with your first taste. * Just ½ teaspoon (0.5 calories) sweetens like 1 teaspoon of sugar (16 calories). Visit our FAQs to find out more about Nature Sweet packets. This sugar free - low calorie product is made with stevia and is conveniently packed into handy sticks. It's the perfect addition to coffee, tea or your favourite beverage. 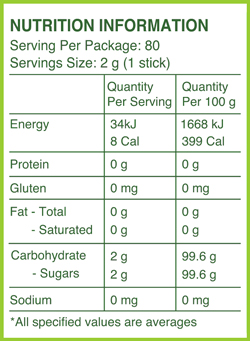 * Just 1 stick (0.4 calories) sweetens like 1 teaspoon of sugar (16 calories).